The Trackless Telescopic Chute is a quick-change option that can be mounted on any of our dual auger- or ribbon-style snow blowers. Extending over 13 feet, the chute provides the operator the flexibility to effortlessly adapt from standard blowing to truck loading. 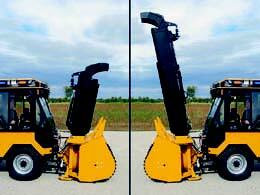 The chute height and deflector angle are hydraulically controlled using the Series 6 joystick inside the tractor cab.